Rats love to dig for treasure! Get a pot plant container or a shallow plastic dish – like a cat litter box – and fill it with soil. Please make sure that the soil has no added fertilizers or chemicals, and check for bugs! Your rats will love digging in the soil and generally making a mess. For variety, you can buy pet grass and plant it in the container. The rats will love to nibble on the tender leaves. If you don’t want to buy a new plant every time the old one dies or gets eaten up completely, you can sow some bird seed in the container. Water the seeds and leave the container in a sunny spot until you can see the shoots coming up out of the soil. It might be a good idea to have 2 or 3 of these containers so that you can have some seeds growing while your rats enjoy the seedlings from the first container. For the hotter summer months here in South Africa, having a ratty pool is just the thing! Get a shallow container – you can use a cat litter box or something similar – and fill with water. Make sure that the water isn’t too deep. It should only reach to your rat’s chest when he/she is standing on all fours in the water. You can add some pebbles or larger stones to the container so that some of the more timid rats can dip their toes in first, before they immerse themselves completely. Do note that not all rats like to swim and they should never be forced to get into the rat pool. Let them explore for themselves. This is an all time favourite of almost all rats, and especially fun in the summer months. Get a sturdy bowl – something that won’t topple with a rat or two balanced on the edge – and pour some water in. It should only reach to your rat’s chest when he/she is standing on all fours in the water. Add some frozen vegetables, such as peas, corn and carrots and give to your rats. The rats have great fun trying to catch the floating veggies and even rats that don’t care much for swimming will try to get to those yummy treats! This is one of the more inexpensive toys that you can give to your rats. You can give them an empty tissue box to play with (you won’t believe how much fun they can have with it) or a full one. Your rats will spend quite some time plucking tissues from the box and carrying it into their nest. Don’t throw out all your empty small appliance and cereal boxes anymore – keep them for your rats! You can build your rat a massive castle or a single storey maze. Cut out holes and make tunnels for them. This is a cheap way to entertain your rats, and the boxes can be replaced when they become soiled. Rats love to sneak into laundry or just burrow in your clothes. Give them their own laundry to explore and nibble on to their hearts’ content! You can use just about any size container and add some old rags and old T-shirts that you have cut into pieces. As we’ve mentioned, rats are very intelligent and need mental stimulation. Wild rats scavenge for food and this activity uses a lot of brain power. Our rats don’t have to scavenge – their food gets hand delivered! You can stimulate your rat’s mental powers a bit by providing puzzles to solve. · Maze – build a maze with a very yummy treat at the finish line. Your rat has to figure out how to get to the reward! Use the same maze setup a few times in a row and see how much faster your rat gets to the prize every time he/she is in the maze again. · Paper balls – place treats in the middle of an A4 paper and scrunch it up into a ball. Give the paper ball to your rats and see how long it takes them to open the ball. · Toilet Rolls – take an empty toilet roll and place treats inside. Block off both open ends by stuffing crumpled paper or material tightly into the openings. Give to your rats and let them figure out how to get to the treats. Pet shops have lots of different types of parrot toys made from wood that has been coloured with food colouring. There are even some lovely bridges that you can use in your rats’ cage. It is preferable that any wooden toys you buy not be made of pine. Buy your rats plastic balls with bells in – most pet shops will sell these for cats. A lot of rats will love chasing the ball around and trying to get to the bell. Some rats will even play fetch! 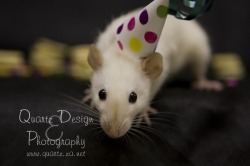 We have so few years with our rats that it is important to celebrate their birthdays, just as you would with the rest of your family. Bake them mini birthday cakes, break out the party hats and remember to sing Happy Birthday! Hand Wrestling – use your hand to wrestle with your rat. You can tickle his ears and rump and flip him over to tickle his belly. Let your rat “pin” your hand too every now and then. He/she won’t have any fun if he/she looses all the time! Take care not to play too rough and not to force this game on your rat. If your rat doesn’t like playing this game, try one of the others. 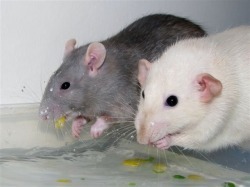 Tug of War – rats like to play tug of war. You can use a piece of cloth or a rope. Wriggle it in front of your rat’s nose until he grabs hold. Start tugging the rope gently until he starts to tug back. As with the wrestling game, it is important to let your rat “win” some of the time, otherwise they will soon lose interest in this game. The Chase – get a piece of string or ribbon and slowly drag it by your rat until he/she notices. You can then drag the string all around and watch your rat give chase and try to catch it. Let your rat occasionally catch the string, and then resume the game. You can end the game by letting him/her catch the string and carry it off to the nest.